When something needs stealing, Mel is the woman to call. But even the best thief has her limits. When someone from her past offers her the one thing that she truly wants she’ll take on an impossible job to get it. Luke Torres keeps his pack’s prized possession, The Scarlet Emerald, deep in the bowels of his Colorado domain. But most days the stone is more of a burden than a treasure. With a long-anticipated vampire summit on the horizon, he can’t afford to lose the symbol of his pack’s power. And when his sister turns up, things go from complicated to disastrous. One alpha, one thief, and an adventure that’s only the beginning. Mel’s goal puts her on a collision course with Luke, leading them both to something they never thought possible and never knew they wanted. And in the end they will both learn that there’s more than one way to kiss a cat. 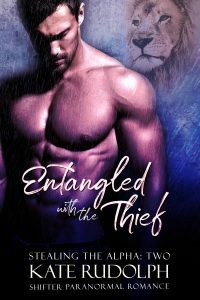 Stealing the Alpha is a three-part series featuring Mel, wereleopard burglar extraordinaire, and Luke Torres, werelion alpha. Join them while they pull off heists, battle witches, learn to trust, and fall in love. It was supposed to be a simple job. Get in, steal the gem, get out. But everything went to hell and now Mel is out her payment and in the sights of an angry alpha lion. Luke isn’t doing any better. His sister is in trouble, the Scarlet Emerald is gone, and Mel is back, ready to face off with him again. But to heal his sister, Luke will do the unthinkable. He will ask Mel for her help to save Cassie’s life. And soon, the attraction bubbles between them, entangling their lives more than they ever asked for. 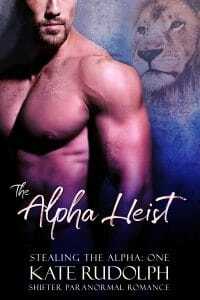 Stealing the Alpha is a three-part series featuring Mel, wereleopard burglar extraordinaire, and Luke Torres, werelion alpha. Join them while they pull off heists, battle vampires, encounter witches, learn to trust, and fall in love. Mel promised herself that she would get her vengeance on the witch who slaughtered her family, or die trying. Now a world-renowned thief, she’s ready to make good. But things are complicated. That witch, Ava, hasn’t just targeted Mel, she’s coming for the only people on the planet that Mel cares about. Luke could never have predicted the path that Mel would bring him down. But now he’ll do anything to save his sister’s life and capture his thief’s heart. Ava threatens his pack, determined to steal a magic artifact of imense power that he never knew he possessed. In the midst of all of this, Luke and Mel have found each other. But Mel doesn’t know how to do relationships, and Luke’s pack isn’t keen on having a thief as their female alpha. When Mel and Luke are together, their relationship is explosive. But that fire will either cleanse… or destroy.